On March 13, 2017 By Shelby BoydeIn What Am I Thinking About? This past weekend, I decided I wanted to take a trip with my husband to the mall so we could get out of the house and walk around. It was nice to jump on the free time we found and get out of our usual routine. While we walked through the mall, we simply looked at the windows of the stores as nothing more than a way to see new things. We bought some food and my husband bought a simple item he had been thinking about purchasing. I tried to be good, but eventually I chose to play my I want card. I pushed for the trip to the mall because there were many different stores to see, but all I really wanted was to go to a bookstore to look for new novels. We don’t visit the mall a whole lot so I had no idea where the bookstore was located. Thankfully, malls have fancy map stands to check out what’s available. I was shocked with what I found! On the section labeled for entertainment (movies, games, books, etc.) there weren’t any bookstores listed! I am so frustrated with the way our world is slowly becoming. I predict sometime in the future novels will not be sold as paperbacks anymore. I hope I am 100% wrong with my prediction but it seems people no longer find it enjoyable to hold a book. They would rather stare at their phones. Sure, I love my Kindle and NOOK apps, but I feel every reader should love the feeling of a novel in their hands. Needless to say, I was defeated. The ONLY reason I wanted to go to the mall was because I wanted to check out a cute, tiny bookstore. The mall left me disappointed and I guess I shouldn’t be too surprised. Seeing my frustraition, my husband willingly let us leave the mall and visit the closest Barnes & Noble. When I stepped through the front doors I felt all my heartache vanish. The best part about Barnes & Noble is the amazing sense of calm the store provides me and I’m sure many others. I love how there are several bookcases filled with thousands of books in many different genres written by hundreds of different authors. So many stories await when you walk through the great, welcoming doors. What more is there to ask for? Originally, I played it off as if I only wanted to look into improving my novel wishlist. I was mainly focusing on manga because I’ve been on a manga kick as of late. But I still walked around my favorite sections to see if there was anything else there to catch my eyes. Romance, mystery, drama, teen (don’t judge), and finally comic/manga. As I looked at my favorite “picture books” (my husband was teasing me) I felt my urge to own more books grow and grow. I tried stepping away several times to break away the want I was beginning to create, but there was only so much I could do. Eventually, I gave in and bought 3 manga books. 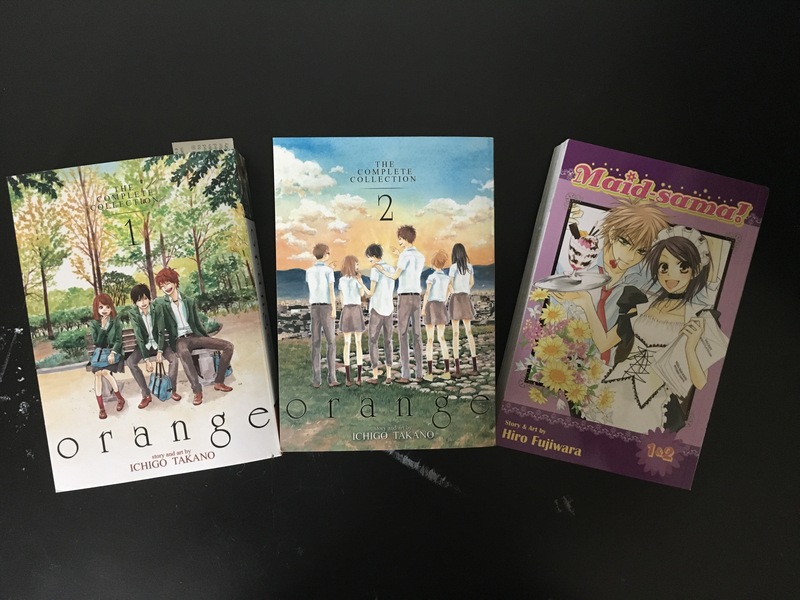 The manga books are: orange: The Complete Collection 1 by Ichigo Takano, orange: The Complete Collection 2 by Ichigo Takano, and Maid-sama! (2-in-1) by Hiro Fujiwara. If you follow the links I provided they will tell you more about the different books. I’ll also tell you a little bit about these novels from my POV without spoiling too much of the story. First, I’ll talk about the orange series. I watched the anime version of these novels so I knew I was getting into an emotional tale before I started. I’m almost halfway through the first book and a part of me is glad I saw the anime first. I was generally prepared for the moments that were able to pound on my heart. For a manga to hold this much power is amazing. If you want to read a manga featuring the strength and love of true friendship I would recommend these books. (I’m already recommending it after only making it halfway through collection 1. That has to say something). Finally, I’ll talk about Maid-sama! by Hiro Fujiwara. This is a manga I imagine only a certain group of people will like. This manga focuses on the relationship of a high school girl and high school boy. It’s all about how chance circumstances bring them together to make a fun story. Since this is the cliché high school love story, I know a lot of people might not like it, but there are a lot of cute and goofy moments in the pages. I read it with nothing but a smile on my face. I would recommend Maid-sama! to anyone looking for a fluffy, young romance. I promise, there’s nothing wrong to take a step back and let your mind become a bit younger again. What kind of novels do you collect? Are you working hard to own all the books included in your favorite series?